EX-Derry City striker, Marc Griffin came back to haunt his former club at Brandywell tonight as he netted the winning goal for Bohemians in the second half but compounding matters for Peter Hutton’s side was the injury sustained to star striker, Patrick McEleney. The City playmaker who led the line superbly up until the 69th minute when he collapsed to he ground in agony after appearing to over stretch his groin, was then stretchered off the pitch. And it’s feared the Shantallow man could be sidelined for several weeks with Hutton claiming the injury was ‘a bad one’. It was a bitter blow for the home lot who had started so well with Philip Lowry putting the Candy Stripes into the lead after just eight minutes. However, despite dominating the chances after that strike with Bohs in apparent disarray, the Gypsies bounced back with a wonderful volley from Kealan Dillon on 26 minutes. That goal settled any nerves for the visitors and when McEleney went off late in the second half it swung the game heavily in their favour and they take full advantage. 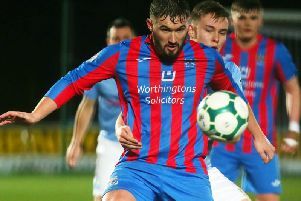 Former City players, Paddy Kavanagh and Griffin combined to break Derry hearts with 12 minutes to go, the latter slotting into the far corner of the net for what proved to be the winning strike. Derry did have their chances to net an equaliser with Mark Timlin’s thunderous free-kick rattling the crossbar while Cillian Morrison found Bohs’ keeper, Dean Delaney in terrific form when he clawed out the Letterkenny man’s header during the six minutes of stoppage time. But it was the injury to McEleney which will hurt Hutton’s troops most given his superb start to the season and his influence in the final third. Indeed, it was McEleney who emerged the architect of the Derry goal in the 8th minute when his cross broke into the path of Lowry who drove his shot into the net. But Bohemians struck back in the 25th minute with that stunning strike from Dillon. The ball had been beaten out of the Derry defence following a corner and when Roberto Lopes chipped the ball into the path of the winger, Dillion’s volley screamed high into the net from the edge of the box. The home side went close to re-taking the lead in the 41st minute when Barry McNamee sent Mark Timlin in but Lopes made a superb last ditch tackle inside the area. At the other end, Derry keeper, Ger Doherty dived a full stretch to meet Dillion’s shot from 25 yards as the home defence failed to close him down. Derry started the second half well but it was Bohemians who really should have moved into the lead in the 62nd minute. Dillion sent in a cross from the right and well positioned at the back post, Griffin recklessly directed the ball wide from close range. And the visitors took advantage with 12 minutes remaining when Kavanagh broke the left before Griffin side-footed the ball home to put Bohemians into the driving seat from close range. Anto Murphy did well to head a Dean Jarvis effort clear of his goal while a superb Mark Timlin free crashed off the Bohs crossbar in the 87th minute. Having denied Shane McEleney with superb save, Dean Delaney made sure of the win when he parried Morrison’s header wide of his goal during six minutes of added time. Bohemians - Delaney; Pender, Prendergast, Murphy, Fitzgerald; Dillon, Buckley (Mulcahy, 63), Kelly (Moore, 85), Lopes, Kavanagh; Griffin (Byrne, 89). Referee - Neil Doyle (Dublin).